This is a summary of what I've learned from many experienced truckers on TruckingTruth, plus the perspective I've gained as my husband went through the classroom training during August-September, 2009. 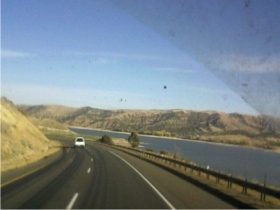 Cruisin down the highway during Phase I CDL training on the road. 1. Research, research, and then research some more! Ask plenty of questions so that you truly understand what you're getting into. You cannot do too much research, in my opinion. 2. Don't pre-judge the school or the company (keep in mind that my only absolute knowledge of this is what my husband experienced at this one particular school). Rumors abound on the internet, and then again at school. Remember, if people are happy with something, they tell one person. If they are unhappy, they tell between 8-10 people. And that statistic may have come before the internet. Now one disgruntled former employee or student can easily spread their news to tens of thousands, hundreds of thousands or more people. We heard so much trash about the school my husband attended, the we were SCARED. But the training he received (so far) seems to be truly top-quality. 3. DO NOT LIE on your application!!! I cannot stress this enough! From what my husband told me, that seems to be the NUMBER 1 reason why people are thrown out of school. Be completely honest about any medical problems, criminal background, work history, infractions on your driving record, etc. They WILL work with you if you are honest. If not, you will be gone. The next most common reasons for leaving school seem to be a lack of general preparedness, the understanding, or an inability to perform the required tasks/skills. 4. Study like crazy the learn everything you can before you get there, the curriculum is extremely fast-paced! If you come there with some knowledge, you will be ahead of the game. Start by reading the CDL manual which can be downloaded free from your state's DOT website. 5. Do your best to have everything at home, plus all your finances and the required paperwork, in order before you leave. The recruiters are overwhelmed sometimes too, and complications can arise. But that will be less likely if you try to straighten everything out before you arrive at school. And you don't need extra worries to distract you once you get there. 6. Go there with a strong, positive attitude and a good work ethic. Do your best to be respectful, cooperative, humble (in spite of any previous experience) and grateful to be there. And don't forget to keep your sense of humor. People with bad attitudes also seemed to disappear from school. 7. Be prepared to learn fast, fast, fast and work hard, hard, hard! Try to stay calm and focused, take lots of notes, listen carefully and soak up the information as best you can. If you don't understand something, ask questions. Remember, everyone else there will be feeling just as tense and anxious as you may be. 8. If you're feeling overwhelmed, that seems to be common. You may doubt your ability to get through it, or you may begin to question whether it was a good decision in the first place. This is a normal reaction, but it will pass. Actually, the entire thing kind of reminded me of having babies...You know it's gonna be hard, but hang tough, keep trying, try harder, then try some more! You may be surprised what you can accomplish! Lots of people struggle all the way through but, from what I understand, very few of them are sent home as compared with those who are leaving for other reasons. It really does seem to be mostly about common sense. And here is some advice straight from me: Most of the people who went to school with my husband had, like him, lost their jobs or their businesses. They were probably not feeling at the top of their game as far as self-confidence the were maybe feeling a bit beaten down by life. That had to make it even more difficult in some ways. But it seemed to me that those are the people who made it through. Really try to enjoy and take advantage of the last of your freedom at home. Rest up, relax, enjoy yourself. Save as much money as you can before you go. There are unknown expenses and it will be a while before your paychecks (once they begin) will reflect your hard work, especially if you're paying off the tuition for the first year.